“I wish people would love everybody else the way they love me. The Olympics has opened to a huge and successful fanfare, courtesy of Danny Boyle. Britain is on the way, after a shaky start, to the medals list, finally getting a Gold. There have been tears, triumphs, disappointments and controversy … and future stars waiting to shine. But before it all began … one Olympic legend was fondly remembered. The man who floats like a butterfly and stings like a bee may have arrived in London a wheelchair but his presence was the same as when he danced deftly around the boxing ring, gloved fists flying. 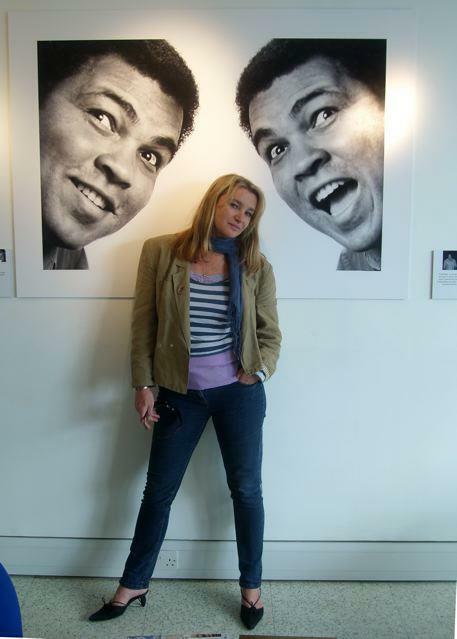 Muhammad Ali celebrated his 70th birthday earlier this year and to commemorate the event a retrospective exhibition is on display at Forman’s Smokehouse Gallery, 100 metres from the main Olympic Stadium. Sitting alongside works by renowned photographers and artists from all over the world, is Brora-based artist Lola Nicol’s painting of the boxing legend. Lola had already painted Ali as a commission for one of her clients, and she was researching boxing clubs, as a lot of them collect boxing memorabilia, when she came across news of the exhibition. 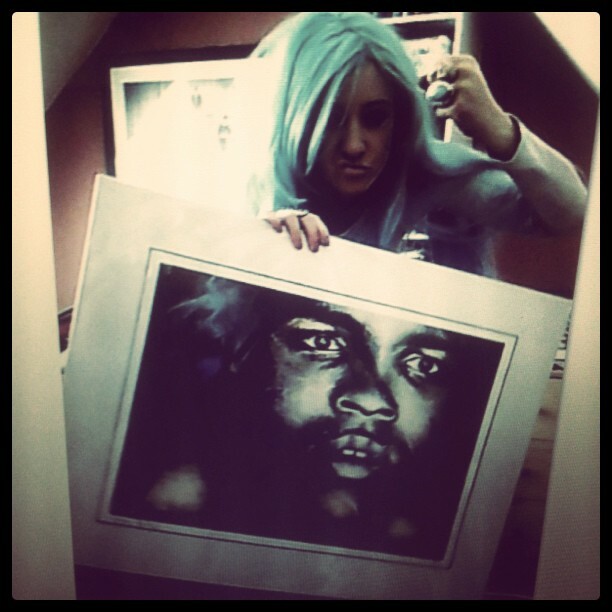 Lola sent the creative director, Dutch-born London-based photographer Christina Jansen, a photo of her painting, initially only hoping to get some kind of response to her painting and maybe some feedback. Lola was interested to know if she had captured Ali and figured Jansen would know. Jansen first photographed Ali in 1986 and it has taken her, and co-curator Sandra Higgins, two years to put In The Rings With Ali together. The exhibition comprises 70 photographs and paintings, including some of Jansen’s own work as well photographs and paintings from other photographers and artists. Lola obviously captured the essence of the boxing legend, as Jansen liked her painting so much she included the piece in the exhibition. In The Rings With Ali shows different stages of the man’s life, alongside video and audio installations, poetry and memorabilia. And not just his sporting life, but Ali’s humanitarian work through the decades is also displayed. That humanitarian work continues. Over a million pounds was raised at a Sports For Peace gala which commemorated Ali, held at the Victoria & Albert Museum on July 25th. The money will be distributed between the Muhammad Ali Centre in Louisville, his Parkinson’s Foundation and the Michael J Fox Parkinson’s fund. During the Gala in London various sports stars and celebrities were privileged to be in the boxing legend’s company and they took time to voice their admiration to the media. “Champions aren’t made in gyms. And it’s been an unbelievable experience for Lola. When she painted his image, she never imagined where it would end up. Ali’s younger brother Rahaman Ali and his wife Caroline flew over from America to attend the opening private viewing of the exhibition on July 19th. All artworks at the “In the Rings with Ali” exhibition will be for sale and a percentage of the profits will be donated to Amnesty International, Parkinson’s Research, and to a local boxing club in East London. 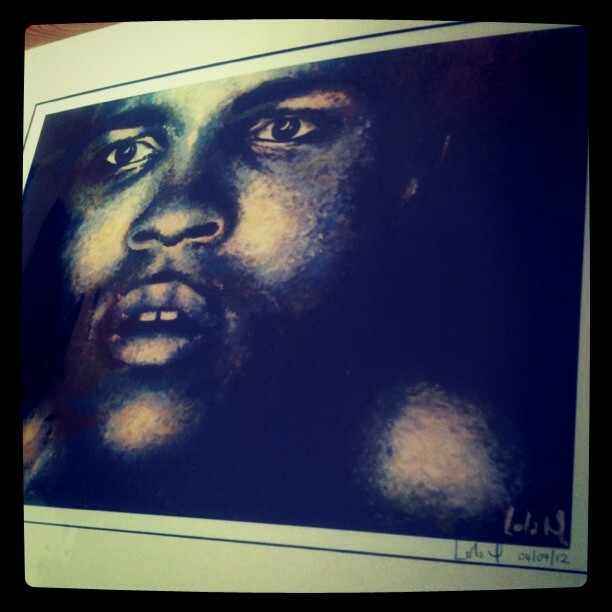 Lola will also have a number of limited edition prints available for sale, and a contribution of each sale will go to the Muhammad Ali Outreach Programme, a programme which will work with young boxers and run by former British light-middleweight/ middleweight champion Oliver Wilson and former Commonwealth Games gold medalist, British light middle and middleweight, Rod Douglas. It is estimated 1200 will visit the gallery on a daily basis. The gallery is open to the public 13th–28th August, Thu, Fri 5–9pm; Sat, Sun 12–5pm and also open to the public from September 8th – 30th. Ali gained Olympic Gold in Rome in 1960. 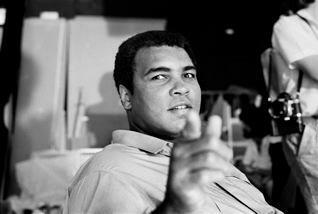 His name at that point was Cassius Clay. In his 1975 autobiography it says that he threw his Olympic gold medal in the Ohio River after being refused service at a “whites only” restaurant.